As shown from the diagram above, the ASP.NET MVC included in 3 main frameworks which each of the framework performs specifics functions for the web applications. 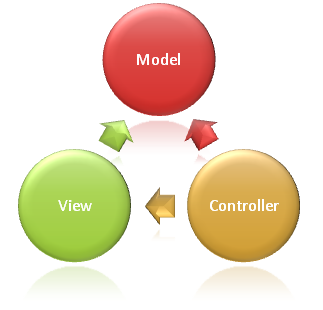 * “Models” in a MVC based application are the components of the application that are responsible for maintaining state. Often this state is persisted inside a database (for example: we might have a Product class that is used to represent order data from the Products table inside SQL). * “Views” in a MVC based application are the components responsible for displaying the application’s user interface. Typically this UI is created off of the model data (for example: we might create an Product “Edit” view that surfaces textboxes, dropdowns and checkboxes based on the current state of a Product object). * “Controllers” in a MVC based application are the components responsible for handling end user interaction, manipulating the model, and ultimately choosing a view to render to display UI. In a MVC application the view is only about displaying information – it is the controller that handles and responds to user input and interaction. Webmaster and developers need to have at least a ASP.NET MVC hosting compatible account to host their ASP.NET MVC website without any problems. For more information about ASP.NET MVC hosting features, log on to http://www.seekdotnet.com, one of the leading ASP.NET hosting provider. As for your information, Microsoft released an initial version of ASP.NET with MVC (model-view-controller) support in December 2007. Since then, more and more ASP.NET developers has switch and adapt the new ASP.NET MVC technology for their web applications. MVC is an architectural pattern used primarily in the Java world, and perhaps used most famously in the Ruby on Rails framework. MVC decouples data access and business logic from data presentation and user interaction, by introducing a “controller” as an intermediate component. Whats new on ASP.NET MVC V2? 3 – From this new infrastructure, bugs can be found at build-time as opposed to run-time, and also enables better code IntelliSense support within view templates. 4 – This helps manage the complexity when building a large application and facilitates multiple teams working on a single application together by using the “relative isolation [from] other sections” where each area of the application can be implemented as a separate ASP.NET MVC project. On more information on finding suitable ASP.NET MVC hosting for your applications, you can check out the ASP.NET hosting plan from SeekDotNet.com as it fully compatible with the latest ASP.NET hosting add-on and technologies. The ASP.NET MVC Framework couples the models, views and controllers using interface-based contracts, thereby allowing each component to be easily tested independently. By default, the view engine in the MVC framework uses regular .aspx pages to design the layout of the user interface pages onto which the data is composed. However, different View Engines can be used (for example, you can create a View Engine based on XSLT files. Additionally, rather than the default ASP.NET post back model, any interactions are routed to the controllers using the ASP.NET 3.5 SP1 Routing mechanism. Professional web hosting provider – SeekDotNet.com proudly announced the integration of the latest ASP.NET MVC framework in all web hosting plans. SeekDotNet.com is the first few hosting company that provide ASP.NET hosting plan that support the brand new ASP.NET MVC Hosting. 1) It enables clean separation of concerns, testability, and TDD by default. All core contracts within the MVC framework are graphic interface based. 2) Everything in the MVC framework is designed so that it can be easily replaced /customized. 3) It includes a very powerful URL mapping component that enables you to build applications with clean URLs. 4) The MVC framework supports using the existing ASP.NET .ASPX, .ASCX, and .Master markup files. SeekDotNet.com Customers and Technical Supports Teams believe that our clients will having more flexibility while developing ASP.NET applications with the ASP.NET Model View Controller framework.